As soon as you begin typing in the first field, say, phone number, a minus sign appears to the left and a new field is added beneath it. You can type a second phone number in this new field. As soon as you begin typing in the second phone number field, a third one appears. This happens with the Phone, E-mail, and URL fields. Don’t worry: Those empty fields won’t clutter up the final view of your contact’s info screen. You only see the blank field in Create or Edit mode. Notice that there’s a line between the field name and the empty field for Phone, E-mail, and URL. You can change the field name of these fields by tapping on the field name to the left of the line. A Label list opens. Click the label you want to associate with the phone number, e-mail, or URL that you type in the adjacent field. Scroll down to the bottom of the Label list and you see Add Custom Label. Tap this and you can enter a label of your own for the field. You can memorize a phone number with an extension so when you dial from Contacts you don’t have to enter the extension. Type the phone number, tap the +*# button, and then tap Pause. The keypad returns and you can type the extension. When you tap Done, a comma appears between the phone number and extension. You can add more than one pause if the system needs more time between dialing the number and typing the extension. If you tap Wait and enter the extension, when you make the call, you have to tap Dial again at the appropriate time after the initial call is made and the extension will then be dialed. Tap Ringtone. A list opens from which you choose the ringtone you want to hear when that contact calls. Tap Text Tone. A list opens to choose the sound you hear when that contact sends you a text message. Tap Buy More Tones to access the ringtone section of the iTunes Store and download tones that can be used for ringtones or text tones. Tap Vibration. A list gives you options for the vibration you want associated with a text message that arrives from that contact. Click Create New Vibration to record your own custom vibration. You can only have one of each per contact. You can’t assign a different ringtone, text tone, or vibration for each number associated with a contact. You can tell how little importance is given to our physical addresses anymore. The Address field is at the bottom of the list — like a rarely used option. 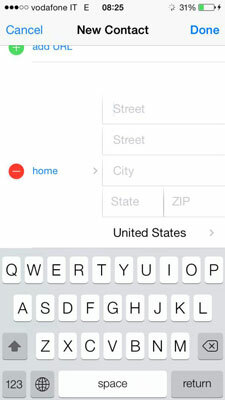 To add an address, tap the plus sign to the left of the field or in the blank field. The field expands. Type in the address. Here, too, as soon as you begin typing a second field opens, so you can add a second address. And, tapping on the field name to the left, you can change the field name so it reflects which address it’s associated with, like work or home or even a custom field, like cabin or boat slip. Tap an address in Contacts, and Maps opens to show the location. 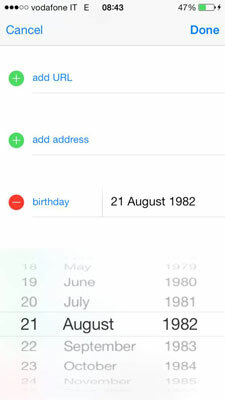 The neat thing about Contacts is that it not only manages information about how or where to contact someone but also information about the person, like a birthday or other important date. If you link your Facebook friends to Contacts, information from their profiles flows into Contacts. This information can also be accessed by Calendar so you don’t forget to call, or send a dozen roses, on the important date. Birthday: Tap birthday and a rotor opens so you can choose the month, day, and year of the contact’s birth date. A birthday that is added to a contact appears in Calendar if you activate the Birthday calendar. Date: The first field name that comes up is Anniversary for this field, after which you can add as many other important dates related to this contact as you want. Use the rotor to put in the date you want. Like the Phone, E-mail, URL, and Address fields, as soon as you add this field, a blank one appears beneath it. You can also edit the name of the field by tapping on it and choosing other or adding a custom label.